Shōchō (正長) was a Japanese era name (年号,, nengō,, lit. "year name") after Ōei and before Eikyō. This period started in April 1428 and ended in September 1429. During this time, the emperors were Shōkō-tennō (称光天皇) and Go-Hanazono-tennō (後花園天皇). 3 February 1428 (Shōchō 1, 18th day of the 1st month): Shogun Ashikaga Yoshimochi died at the age of 43. 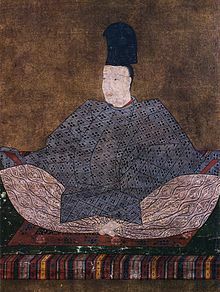 30 August 1428 (Shōchō 1, 20th day of the 7th month): Emperor Shōkō died at he age of 27. 8 September 1428 (Shōchō 1, 29th day of the 7th month): Emperor Go-Hanazono is established on the throne at age 10. ↑ Nussbaum, Louis-Frédéric. (2005). "Shōchō" in Japan encyclopedia, p. 877. ↑ Nussbaum, "Shōkō Tennō," p. 883. ↑ Nussbaum, "Go-Hanazono Tennō," p. 252; Titsingh, Isaac. (1834). Annales des empereurs du Japon, pp. 327-331. This page was last changed on 31 August 2017, at 11:55.